Restaurants in Jamaica come in all sizes, descriptions and locations. From the tinest cookshop and the roadside jerk centre, to the gourmet restaurant, delicious food is never far away. As is my habit, I'll focus on my home parish, St. Elizabeth. Then I'll ask my friends (that includes you) to say a little about choice Jamaican restaurants across the island. One of my favourite restaurants in Jamaica is Jack Sprat in Treasure Beach. 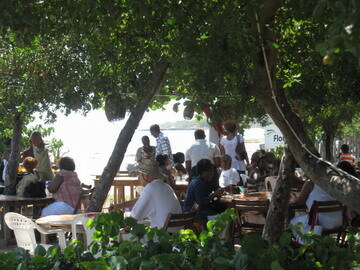 Very casual and relaxed, this seafood/pizza restaurant is set right by the sands of beautiful Calabash Bay. There's delicious fish, lobster, shrimp, crab, conch and pizza. Be sure to try some bammy with your seafood order. You can choose to eat insde, or under the lignum vitae trees (our national tree). While you wait for your order, you can walk on the beach or have a swim. My son likes to find an isolated corner of the beach to throw his fishing line. There's Devon House ice cream for dessert, in conventional flavours, as well as flavours with a uniquely Jamaican twist, such as soursop. Las Vegas Cafe on the beach in Black River offers excellent seafood, and is on the rise as a choice venue for weddings and medium sized gatherings. 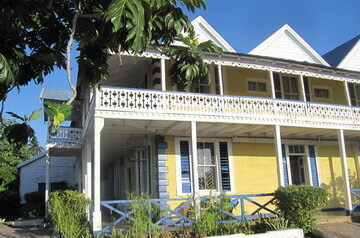 Waterloo Guest House in Black River serves a variety of Jamaican and international dishes. Set in a 19th century Georgian house, this restaurant is open for breakfast, lunch and dinner. For breakfast you can have American/European fare like bacon and eggs, cereal and toast, or Jamaican dishes such as ackee and saltfish. The lunch and dinner menus have the obligatory fried chicken and rice and peas, but other dishes like steaks, pork chops, chop suey and seafood can be done to order. Dessert includes apple pie, cheesecake, Jamaican bread pudding. Eat inside by the bar, or outside on the wrap-around verandah facing the sea. Reasonable prices, pleasant setting. In Holland Bamboo there's a small restaurant that sells great curry and roti. There's no sign, and no official name that I know of, but the food is really good, and priced for every pocket. It's located on the roadside near the school (left side coming from Black River). Just ask one of the locals for directions. No frills, but very clean. Tasty Foods in Black River serves man-sized proportions. This restaurant is housed in an old brick warehouse near the bank of the Black River. It does a roaring breakfast and lunch trade. Real hearty Jamaican breakfasts such as mackerel rundown, stew chicken, ackee and saltfish are served with Johnny Cakes, cornmeal dumplings, boiled bananas, and yam. Hominy (corn) porridge and peanut porridge are other popular breakfast items. For lunch and dinner, there are staple items such as chicken, fish and stew peas. Their serving sizes guarantee that you don't leave hungry. Juici Patties, a local franchise is where many Jamaicans by their lunch. There are locations in Black River, Luana and Santa Cruz. Now I'm going to leave it to my friends, family and all you folks out there to tell us about your favourite Jamaican restaurants. Tell us which restaurants in Jamaica would keep you coming back again and again. Is it just the food, or do the setting, the vibes, the service and the price have anything to do with your choice?